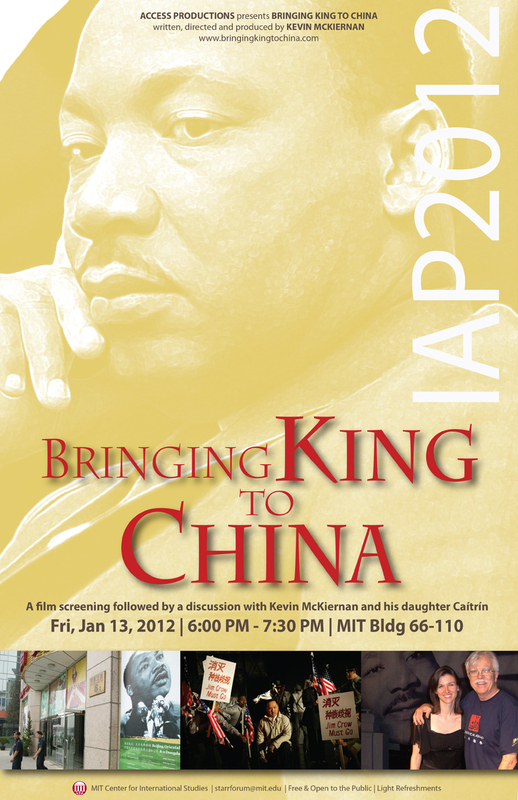 Bringing King to China is a father's "love letter" to his adult daughter, a young American woman struggling to bring Martin Luther King, Jr.'s dream of nonviolence to China, and then back to the United States. Her life is thrown into turmoil when she learns, mistakenly, that her father, a journalist covering the war in Iraq, has been killed by a suicide bomber. The filmmaker is Kevin McKiernan (Good Kurds, Bad Kurds; The Spirit of Crazy Horse). The cinematographers include Oscar-winner Haskell Wexler (Who's Afraid of Virginia Woolf; Bound for Glory). Kevin McKiernan's career as a journalist and filmmaker has taken him to some of the world's most troubled regions, from Nicaragua to Iraq to West Africa; his work, nominated for the Pulitzer prize, has been published by Time, Newsweek and The New York Times, and appeared on ABC, CBS, NBC and PBS. Caitrin McKiernan first went to China at age 16 for a study-abroad program. She taught in Beijing after attending Stanford. Caitrin graduated from University of California Berkeley Law in 2011.